Unless you’re a diehard auto enthusiast – familiar with every last nut and bolt under the hood of your car – it can be difficult to figure out which brake rotors are the right ones for you. Will OE replacement rotors get the job done? Maybe your car would perform better with Slotted and Dimpled rotors? What does dimpling even do, anyway? It’s understandable if you feel overwhelmed at the choices in front of you, so we’ve put together this convenient Buying Guide to make your choice crystal clear, and to maximise the stopping power of your car. 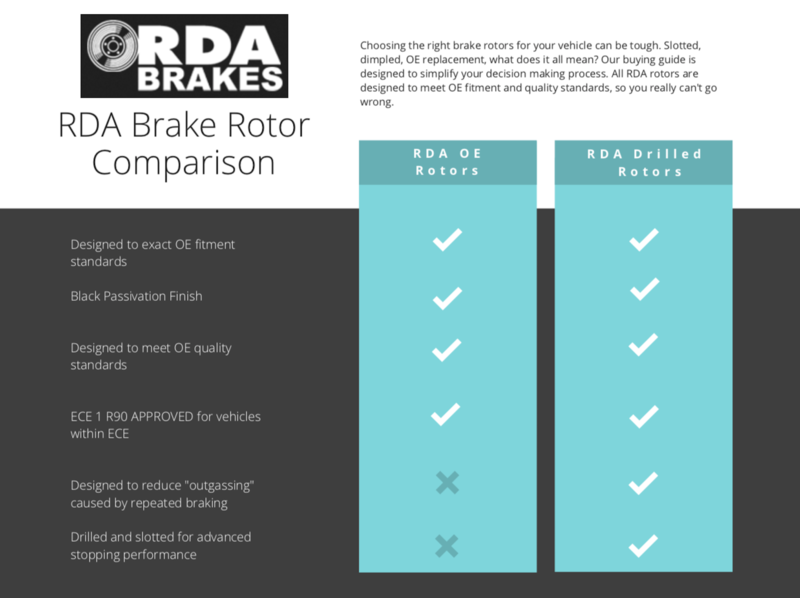 RDA’s OE replacement brake rotors are the ideal choice for the average driver looking to replace their brake rotors. Designed to retain the original feel and performance of your car’s brakes when they were new, these traditional rotors have been sourced from the world’s best manufacturers to ensure the highest quality across the board. RDA’s expansive range has models to suit more than 2,100 vehicle applications. What Makes Slotted and Dimpled Rotors Special? For drivers looking to improve the performance of their vehicle and add a little something extra to their braking power, slotted and dimpled rotors can be an effective and economical choice. This style of rotor was initially devised to maximise performance, aerodynamics, and encourage faster cooling in trucks and heavy cars. However, despite this initial application, the benefits soon became apparent and they began to be developed for the automotive market at large. Today they are available for virtually every type of vehicle. RDA’s grooved and dimples rotors are a simple, cost-effective method for improving the stopping performance of your vehicle, no matter the make and model. A slew of specially engineered characteristics improves the performance of your brakes to leave you with peace of mind and the ability to stop on a dime. The grooved surface of the rotor encourages the dissipation of water, dust, and grime, keeping the contact area of your braking system free of the grit and gunk that can keep them from working at their peak efficiency. Adding to that effect, the contact area of the rotor has been deglazed, which helps to improve the integrity of the pad and rotor surface. The rotors also feature directional slotting, combating the common problem of out-gassing. Out-gassing occurs when gas from your brake pad’s bonding agent forms a cushion between your pad and rotor. This cushion can severely impact performance, reducing the bite of your brake pad. The slotted surface helps to minimise this issue, ensuring that your brakes retain that powerful, responsive feel. Boasting the largest range of Disc Brake Rotors and Brake Drums in Australia and New Zealand, RDA Brakes have an ever-evolving range of brake parts extending to an impressive 2,400 vehicles. Whether you’re looking to improve or maintain the performance of your car, truck, or 4WD, RDA will have a set of rotors that are certain to meet the needs of your vehicle. Which Brake Rotors Will Fit My Vehicle? Sparesbox uses the latest cataloguing technology to make the selection of your brake discs as easy as possible. However, manufacturers can change rotor dimensions between model years or provide optional sports braking upgrades with different diameters. Please check the rotor sizes carefully and if you need extra assistance please contact our customer support team for guidance.